Look after your greatest tool - your hands! Alligator tape is an essential in every jewellers workshop, used to protect your hands and fingertips from minor cuts, abrasions and burns. 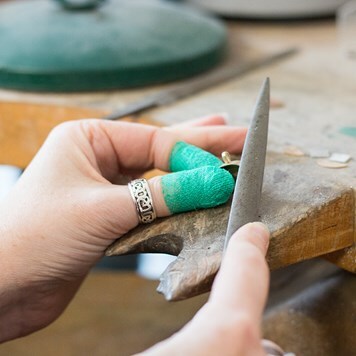 It's so important to look after your hands when jewellery making, especially during busy periods when you're rushed off your feet getting designs finished. This finger protection tape comes in a 90ft roll, which is long lasting and once wrapped around your fingers, it's easy to remove - meaning you can pop the tape back on if you need to leave the bench. The alligator tape is thin and flexible, providing great grip and making it ideal for filing, sanding, polishing, buffing, grinding and stone setting. It only sticks to itself and tears easily so you can top up your tape quickly - and we must say, we're quite a fan of the green! Scroll down to the bottom of the page to watch us apply the finger protection tape. My old used finger protectors, without these I would have no fingers! Testing out my new alligator tape from Kernowcraft. At first I didn’t put enough on but was great when I got it right! I had a bit of an accident last week, so this week I'm securing my fingers with alligator tape from Kernowcraft. I'm such a klutz in real life, let alone with tools! Busy in my workshop today! Finally got round to using my alligator tape and protecting my fingers! Off for a manicure Friday so didn't want to make their job too difficult! Finally found a way to stop myself from polishing off my fingertips! Thank you Kernowcraft for my #alligatortape! Wish I’d known about this before the mammoth Christmas polishing sessions. Going forward I might actually be able to use Touch ID on my phone! My fingers and fingernails take such a battering when I’m making my jewellery, what with all the filing, hammering and polishing it’s difficult to keep them looking nice but the alligator tape from Kernowcraft is perfect! I can work away as if I didn’t have it on whilst still being able to have my nails done every few weeks and keeping them like freshly polished nails! So, apparently, the way I hold my file has been giving me a callus on my middle finger. Not sure why it took me this long to think of putting alligator tape on it. Anyone else have calluses from making jewelry... or is it just me? - Lyn, Donut Child - a doll maker, showing alligator tape isn't just for jewellers! Can't live without... my precious alligator tape! Alligator tape isn't adhesive but clings to itself, a bit like vet wrap or kinesiology tape. I use it to protect my fingers when I'm filing silver and cut out a bit of heat when I'm using polishing wheels. It also helps me to keep a grip on small items as I suffer from major butterfingers! When you get home from the school run and realise you forgot to take off the alligator tape... it helps my fingers but not sure the other mums get it! Proving that sometimes I *do* have nice nails - alligator tape from Kernowcraft is totally the way forward! Especially when you’re rocking Dior nail varnish! Protecting the nails to see if they will survive the workshop with finger tape from Kernowcraft. love it! Kernowcraft - you know you are a jeweller when you can't find a plaster so rely on that trusty alligator tape!